The Flat Belly Diet May Be One Of The Best Diets Ever! Crack one egg and place in a mixing bowl. Separate the other egg and discard egg yolk. Place egg white in bowl with first egg. Add margarine and sugar and beat well. Dump flour on top of egg mixture and sprinkle baking powder evenly over flour. Using a fork, blend baking powder into flour. Continue mixing flour into egg mixture until well blended. Add cold water and use hands to press dough into a ball. 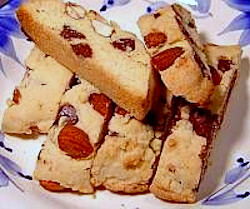 Fold in almonds and chocolate chips. (You may need to use your hands to blend as dough will be stiff.) Ed. note: In reality, you are actually poking the almonds and chocolate chips into the dough. Shape each half into a narrow log six to ten inches long. Spray a cookie sheet with non-stick cooking spray and place dough logs on the cookie sheet. Flatten logs with your hands to about one inch thick. Separate the flattened logs so that they do not touch. Place in hot oven and bake for 20 minutes. Remove from oven and allow to cool for 15 minutes. Turn oven back on to 275 degrees. Place logs on a cutting board. Trim off ends and cut into 1/2 inch slices. Place cut slices back on cookie sheet, cut side down. Return to oven and bake 15 minutes. Turn and bake for another 15 minutes.